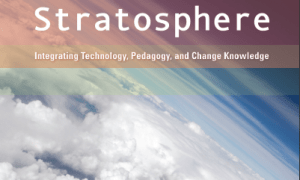 At ISTE 2012 in San Diego this year, I had the pleasure of hearing Michael Fullan speak to his book Stratosphere: Integrating technology, pedagogy, and change knowledge. This is the first time that I have heard Fullan mention technology at all in relation to effecting change for student engagement and achievement and to pedagogy in general. Early in his talk, Fullan mentioned that “the only thing worse than being bored is teaching the bored.” As a person that has devoted a large part of his career to engaging students to best meet their own individual needs, strengths and interests this particular quote resonated with me and continues to do so. Any teacher that has ever been in front of a group of students can easily identify a student that is bored, disengaged, and otherwise unenthralled with a lesson, activity, or topic. That’s the easy part…identifying the bored. The harder and more interesting question is how to relieve the boredom, how to reengage the disengaged, and how to resurrect that love of learning that all young children in JK/SK-Grade 2 have. Better yet, rather than having to resurrect the love for learning, how to we sustain early so that disengagement in learning never occurs? In this regard, Fullan spoke to a graph which showed a solid and continued declinement in enthusiasm to learn from 95% in kindergarten to 76% in Grade 3. That’s a 20% declinement in engagement in just two years. It gets worse. The data Fullan shared indicated that this # dropped even further to approx. 58% by grade 5 and a whopping 37% by Grade 9. I must say that I noticed a strong lack of engagement in students very early in my teaching career. After all, the novels they were reading were the same I had read 20 years prior and the assignments weren’t much different either. At that time, I made a pact with myself that I would not teach students the same that their parents were and would make their learning as relevant, as exciting, and as contextual as possible. After all…why would I subject them to the same boring lessons that bored me? For me, the integration of technology into the teaching and learning process was essential. I blended learning for my students before I had even heard the term and I provided students with a medium and outlet to utilize the technology and gadgets they were accustomed to in their daily life. For the past few years I my role as a consultant I continue to support teachers with the fluid and seamless integration of technology into their teaching and learning cycles as both a means to engage students, increase student achievement, and engage the children’s parents in the same. Overall, Fullan mentions that technology has dramatically affected virtually every sector in society that you can think of except education. I have seen this. I have encountered many a teacher and principal that has told me that “technology gets in the way”, that it “distracts”, that it “confuses”. I have even had some tell me that they “…don’t have time to learn new things.” If Fullan’s numbers are accurate and the steady drop in student enthusiasm is as extreme as he says then the moral imperative demands that we make time to learn new things, that we work as hard as we can to understand each and every student as an individual and, yes, use technology in whatever way possible to enhance the learning experience, to provide opportunities for success, and to make all aspects of learning transparent for all stakeholders involved. The key here, however, is that students are not engaged by the sheer virtue of a devices existence. “Technology must be based in good pedagogy.” Their must be a solid purpose and goal for the use of any tool in the teaching and learning process and technology is no exception. For you see, it is the teacher that engages the student, not the technology. We must also remember that just because students can be engaged through the use of technology, it doesn’t mean they are learning anything. As with anything, the integration of technology into learning must come with the appropriate professional development to support the teacher in both the technical use of the equipment and the pedagogical use of the equipment. Technology changes practice – and practice must change with it. All of these pedagogical strategies to support learning are made easier and more efficient with technology. And, further, all of the strategies I’ve listed about can be easily shared on a website, blog, email. Or text with parents so that the learning of their children can be made visible and they have an opportunity to engage in that learning with understanding and context. Technology truly shatters the brick and mortar wall and turns them into glass. I can’t think of any parent that wouldn’t appreciate that. Like anyone learning new things it is important to know that you are not alone and at you are supported. Opportuntieis to collaborate, connect, and learn are key. Only then will change for the benefit of students occur. NextWho Needs PhotoShop? Pixlr Rules! Thank you for this beautifully-written, thoughtful piece on a subject that has perplexed me as I try to excite my college-level students. If, as Fullan sugggests, the decline reaches 39% by grade 9, how much farther does it drop by college. Even though I require my students to bring laptops to every class and work hard to spark them each class, I still kid them that they must all be constipated!to show such slight enthusiasm on their faces. In any case, keep up your great work. I’m sorry I missed Fullan’s lecture in San Diego. I’ve had the pleasure of seeing him twice in London. Thank you for writing about the essential points. I look forward to reading the book. Waiting for the Kindle addition!